The theory sailing up the Hayling Island shore to Langstone entrance is that the harbour has a long entrance spit (the East Winner Sand) running straight out to sea for half a mile on the eastern side of the entrance ---so that the spit (exposed at mid-tide) provides a breakwater for a shallow-draft boat coming along the shore from the east---and previously I have pulled the boat through shallows across the bar, or landed on it with the wheels and pulled a hundred yards across the hard sand. This time was going to be different, with the tide well in, and the waves coming in over the spit, now as whitecaps, not fully breaking but steeper in the shallowing water. The long beat along the island had brought up lunchtime, taken by turning into the little low-key boat harbour tucked behind the entrance to the harbour, for a quick landing on a stony beach. Even this short stop revealed that the day had changed, with wind and cloud building. So the run after lunch up into the wide harbour was very quick in flat water, through the moored small boats. Langstone is Chichester Harbour's poor cousin, little built up, working boats at the moorings near the entrance, and then quickly wide and empty as you go further in, with fast sailing in flat water in all but the lightest breeze. This time, with rain and more wind catching me up, the smooth water turned choppier, moving fast sitting on the back of the boat, heading for the top NE corner and the road bridge coming up. There is no choice once you get there about the course in to the landing---the demolished railway bridge has a narrow centre channel, a lost swinging bridge with a platform on rollers (photo below, on a gentler day) and it was a matter of committing to the entrance running dead before, blessing the lower power of the Classic rig, and rushing amongst the moored boats in flatter water, gybing and landing at the slipway. This time, rain and wind gave no time to pause, grabbing the first space offered by a motorist in the traffic stream. But the world on the other side was absurdly different---the sun came out, the road bank sheltered the brisk wind, and the high tide gave a wide expanse of flat water, civilised enough to pause for photos. 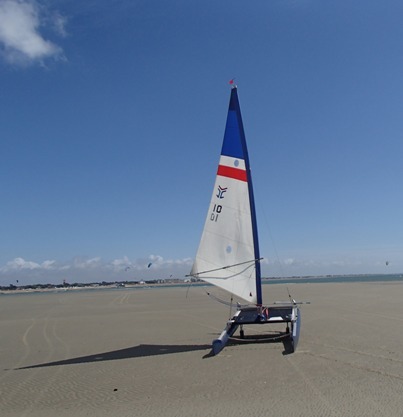 Then swinging around to go down into Chichester Harbour, tightening up from a flat run onto a reach, moving faster and faster (past a little Weta trimaran) down into the wide harbour, with International 14's flying under spinnakers. The fast reach took me down to the morning's landing place, to then turn to run up the eastern arm back towards Itchenor again (passing two of the 14s now righting themselves after rolling in all standing.) The wind now with the making tide gave smooth water and a broad curving run along the lines and lines of boats moored at Itchenor. 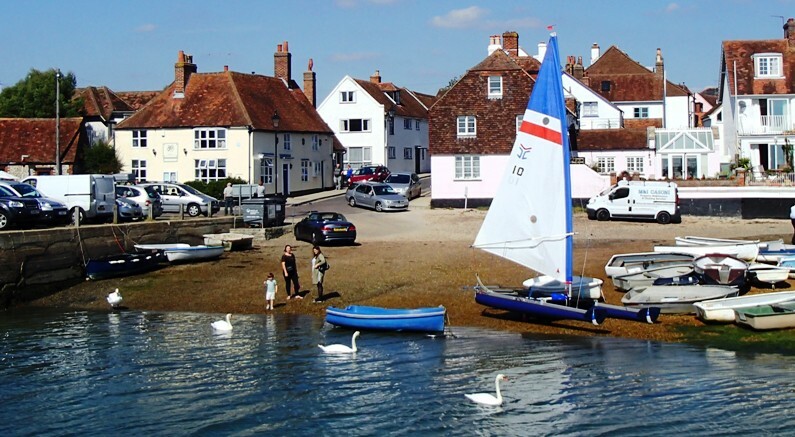 The complete Harbour Tour has to include the shorter harbour arm up into Bosham Harbour, with brief views of the Cathedral in the distance, and then the Saxon church above the moorings and old houses right on the water at high tide (photo below.) Harold had pretty much this view, looking back as he set off for Normandy to meet William and precipitate his fate, after praying in the church the day before---easy to stand where he knelt. 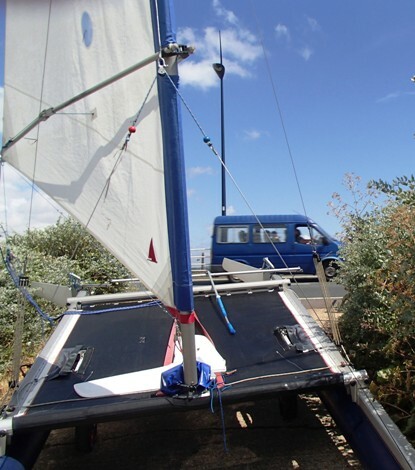 Then the Classic rig's ability to tack very quickly helped the beat out through lines of moorings, with a short board across to Itchenor's wide hard. Next time?---after each time round, a quieter tour around the shores of Chichester Harbour looks sensible and attractive, but come the day, will it still seem right to head away to find Langstone?